How Much Does A Paint Brush Really Cost You? Home / / How Much Does A Paint Brush Really Cost You? Many homeowners fall into the trap of thinking they can skimp on price when it comes to buying paint brushes. This can be a big mistake for a number of reasons and they all can cost you days of extra work. Drawing from my own experiences and the wisdom of other experienced painting contractors in the industry, I have listed a number of considerations that will help you when choosing brushes. Will the brush properly pick up and release paint? A paint brush that doesn’t pick up and release paint properly can cost you a lot of time and hard work. Always buy a paint brush that can be tipped easily? Tipping affects how a brush will spread paint. Not all manufacturers design the tip of the bristles the same way. Some sand the end of the bristles to achieve a feathered end. Some use an abrading method that actually splits the ends of the bristles. This makes a difference in how well it holds paint and how evenly the paint brush will spread paint. Are the bristles of the brush going to last from project to project. Nylon is the longest-wearing filament used in brushes. Always buy a brush that has proper flex characteristics. A paint brush with proper flex helps distribute the paint more evenly. It helps maintain its shape during its use and avoids over spreading (Loss of Control). If you are pulling and pushing or flinging and spattering paint, you are over working. A good quality brush will go a long way in preventing these problems and deliver a better quality job in less time. What type of finish are you wanting to achieve? To achieve a fine finish you need a softer finer filament that has a more finely finished tip. This is not only important in terms of finish but also it will reduce how many times you have to dip the brush. This is another time saving feature. What type of paint are you going to be using the brush in? You should use nylon in latex paint only and China Bristle for oil paint. Even though there is nylon polyester mix brushes on the market that say you can use them in either latex or oil, I find you are better off using China Bristle for oil paints. The solvents needed to clean oil paint out of your brush don’t seem to damage the China Bristle brushes. However, solvents do have a negative impact on nylon brushes over time. Also I find that oil paint cleans out of China Bristle brushes in less time than nylon. Be sure an buy the proper size brush for the project. The bigger the brush the more paint it will hold, but there are things to consider here. For production, a brush needs to pick up and hold a lot of paint, then spread the paint evenly as you spread the paint over a distance. This reduces dip and spread time which in turn shortens the time it takes to complete your project. One size brush will not meet the needs for the whole project. 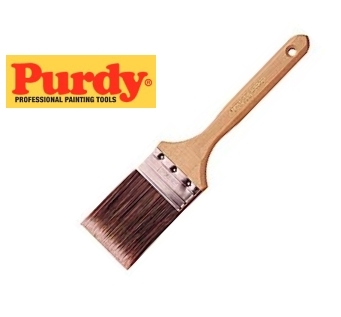 I recommend a 3-1/2 inch brush for painting siding or large opened areas. This is an ideal size for siding. It holds a lot of paint and yet not too cumbersome.However, the 3-1/2 inch brush is too large for some trim. For trim I recommend a 2-1/2 or 3 inch sash brush. The sash brush has the proper angle cut, and density of bristle that make cutting in your trim much easier and faster. Don’t use a 31/2 or 4 inch brush on areas where you should be using a smaller sash brush. Save yourself a lot of headache. Using the sash brush will make your job of cutting in the trim much cleaner, and faster. Also, don’t use a 2-1/2 inch sash brush on large wide open areas where you should be using a 3-1/2 or 4 inch brush for production runs. There are a number of high quality brushes on the market today. 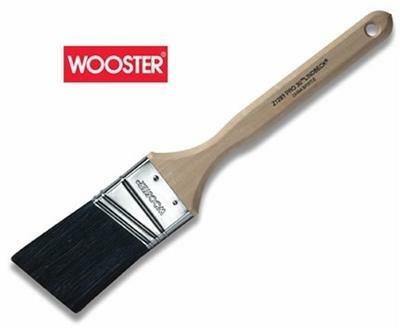 My painters use the Purdy or Wooster line of paint brushes for the very reasons I have listed above. These brushes deliver the performance you need. One final thought: The most important thing for a painting contractor is time and quality of finish. The less time wasted using cheep equipment the more productive and profitable he will be. Shouldn’t you consider the same?